We were asked to create a versatile live-work space from an existing 1800 sq ft floor-through loft with 700 sq ft of roof space. 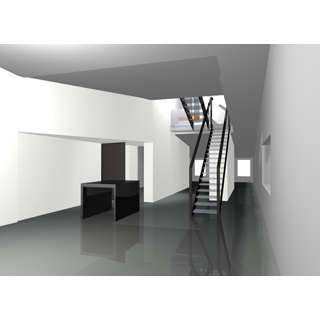 The client wanted to be able to make a complete separation between the work space and living space (with separate entrances), to provide lodging for his assistant in the studio area, have many weekend guests, or to open the space for entertaining or private viewings of his work. It was also important to create outdoor living spaces as part of the roofscape. Our strategy was to organize the program in order to allow the experiencing of the entire 85 depth of the loft as well as a new 35 hight vertical space, punctuated by a ribbon of skylights. Glass tread stairs climb up through this new space, allowing a maximum of light into the loft. Various platforms encircle the void, functioning as sleeping areas, lounges, office areas or work-out rooms. Each of the upper rooms has direct access to an outdoor space. All of the utilitarian functions are packed into the thickness of three walls; the kitchen is hidden away in the north-most wall, parts of the bath room, a dumbwaitor and other mechanical and plumbing functions make up the middle wall, and a free-floating station houses studio kitchenette, assistants sleeping + desk area, laundry facilities and the sliding partitions which separate studio from the living space.